When I read Alex Snyder’s article titled “Are You Being Left Behind?” it confirmed that data PCG has been collecting on dealership investments in digital marketing education should be shared here first. We polled dealers about their investments in Digital Marketing education and some of the responses tie right into what Alex said in his post. So before I add my commentary, here are a few questions and answers from the PCG Digital Marketing survey. Keep in mind that the responses are skewed towards enlightened dealers. Since the survey was promoted on Twitter, Facebook, and social media channels; only the most connected dealers most likely responded. This should give you even more of a case for Alex’s point about investing in the next generation of dealership leaders. 1. 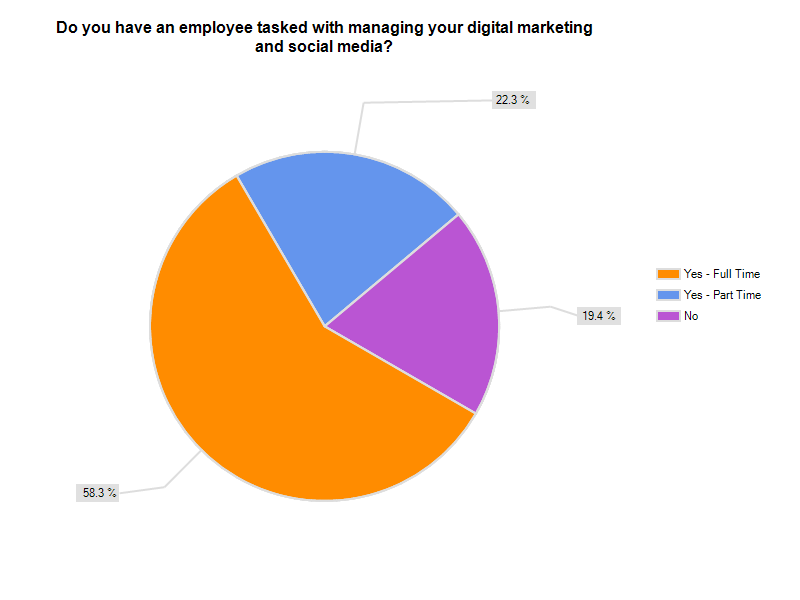 Do you have an employee tasked with managing your digital marketing and social media? 2. Do you feel that the EXISTING dealership staff has the TIME and SKILLS to create and manage a competitive digital marketing and social media strategy for the year ahead? 3. Do you have an annual budget to train your existing staff to increase their skills and knowledge in the area of social media and digital marketing? I’ll let you make your own comments, but what I see from the data is lack of action, not lack of knowledge. Over 65% of those taking the survey had the authority to invest money into educating their staff yet they chose not do. Ironically, 58% of those survey felt that their internal team was not able to create a competitive digital marketing and social media strategy. In industries outside of automotive retailing, new talent, skills, and a future workforce is introduced to various career path via Internship Programs. So we asked dealers if they had considered creating an Internship program to attract the skills and knowledge that their current workforce was missing. As Alex pointed out, the next generation of workers has grown up with many of the tools that are standard operating procedure for growing businesses outside of automotive retailing. 4. Have you considered starting an internship program at your dealership for social media and digital marketing in partnership with a local college or university? 5. 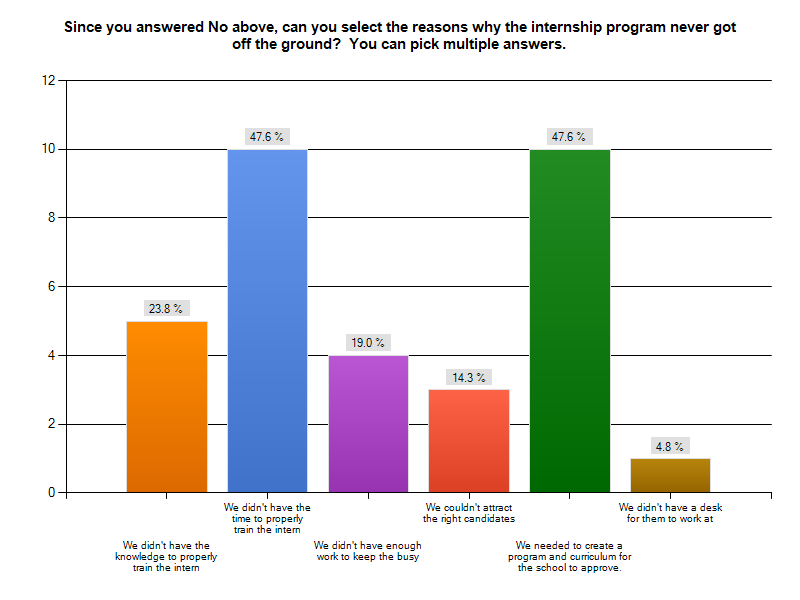 For those that answered “No” above, can you select the reasons why the internship program never got off the ground? The PCG survey data gave me the impression that dealers are like deer caught in the headlights. They admit that their staff is not fully trained; yet 60% said they had no budget set aside for education. This number is more likely to be 80% if we could survey all dealers who are not active online. The fact they dealers thought about creating an intern program but could not teach initiates or create a curriculum that would be approved by colleges amplifies the problems that dealers are facing. In 2011, dealers need to consider the implications of not investing in the skills development that their employees need to be successful. How will dealers build the next generation of leaders if they can’t attract bright minds that have energy, passion, and digital entrepreneurial skills? Leaving eCommerce Directors home from NADA, as Alex points out, is a mistake. The greater mistake is to “leave them behind” all year. Listen and learn or be left behind — that works for me! Of course that plan relies on friends like Brian who are willing to teach so remember to share his wisdoms — including this post — with your clients and friends. After all, what are friends for! Brian, you bring up a highly disputable topic. Well done! I'll make this as to-the-point as possible. Let me start by saying that many dealers don't have the resources, personell or time to take their own photos or even write great descriptions on their vehicles…let alone take aboard their Online Marketing. As forward-thinking as our dealers are, I will say 95% of them are not interested in managing any portion of their online marketing including PPC, SEO and Social. Even our dealers with Marketing Directors, "eCommerce" managers in place are busy managing the process…not the front-end. Additionally, it has been proven time after time that the COST of managing your Online Marketing in-house vs. hiring a 3rd party simply doesn't make sense to take it in-house. In order for a dealership to match the quality and attention of an agency, they would need to hire at minimum a Campaign Manager (hands-on) and an Account Supervisor ("eCommerce Director") to oversee the marketing. I'll let the dealers do the math on hiring, but I assure you it's going to be at least triple or quadruple the cost of an agency….plus you have to deal with all the employee woes including turnover. I find that when you poll a dealer, they are too embarrassed to say they AREN'T interested or putting initiatives in place to manage it themselves. So you end up with skewed answers. Great post Brian. I appreciate someone trying to quantify what many of us already know or at least suspected. Put simply, dealers are not just being left behind, they were left behind five years ago and the prospect of catching back up is just too daunting or scary for many to even attempt. So what do they do? 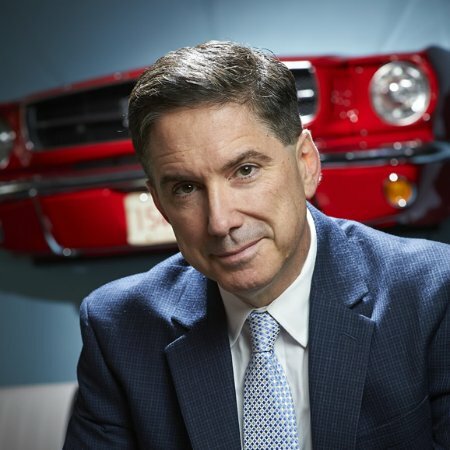 Terrence (who's ideas are always worth more than $0.02) provides one way to make up ground quickly and without mortgaging the dealerships bottom line to do it. I don't disagree with him either. For all but the most advanced dealerships, hiring a full time employee or growing one from within is just too full of risk and unknowns. With that said, Brian's statement, "dealers need to consider the implications of not investing in the skills development that their employees need to be successful" is still right on point. It is vital that dealerships educate themselves and ensure that they have someone in house who is able to speak the language, QA any paid services, and proactively manage the agency. It is a digital game and dealerships better make sure they have the players and the tools to compete. The dealer that takes the risk to hire and invest this "digital player" enjoys an enormous lead over their competitors. Easy to say… hard to do. Interesting post and stats but my big concern is giving digital marketing and social media equal weight. Digital marketing is the future of dealerships, social media is one very, very small slice of digital marketing. The impact of Facebook and Twitter cannot be underestimated – they will never be more than a niche play in customer acquisition, loyalty or retention. The bubble has burst on both in the U.S. and they are in decline in usage. Think of your own personal experience with either service – are you using it more and more to communicate with friends and colleagues over time, or has your usage decreased over time after an initial rush of usage? The danger for companies with limited resources is wasting too much time on useless, yet shiny, programs like Twitter and Facebook when they should be focused on true digital marketing opportunities. January, 2011 news articles state that Facebook overtook Google in visitors in 2010, both in the U.S. and the U. K. That doesn't sound like a bursting bubble or decline in usage. Agreed they are both just a part of an overall strategy, but not sure about your relegating them to has-been status. As a service provider my business is built on doing work for dealers but my point is that dealers must have the ability and knowledge to lead and inspect their marketing strategy. Dealers and their staff also have an important role to play that cannot be outsourced. I have heard many times from vendors that dealers should outsource their phone calls into a third party BDC and they make the same argument you make about costs. Their claim that the efficiencies are a no brainer. The fact that very few dealers outsource their BDC says to me that its not just about the money. Dealers want to mold, coach, inspect, and challenge real people in their dealership to listen to those that call for cars, service, or assistance. They want brand advocates. A third party call center with round robin agent calling does match that experience. Digital Marketing is not a simple 15% calculation on spend. Dealers need to be a part of their third party marketing solutions. There is a give and take to get the information, message, and experiences out to market each month. That means that dealership staff need to prioritize this task, and see the importance of communicating with their digital agency. In your example, a dealer who spends $1,300 a month or $15,000 a year would be misled if someone sold them that they could have a comprehensive digital marketing solution delivered by a third party at that price. Third parties can't film customer testimonials. Third parties can't work with customers in the showroom to create awareness of the important of online reviews. Third parties can't deliver the same impact of passionate internal employees that know every detail about their dealership. So my point is that dealers have to invest in their people to handle their part of the equation. Most likely they will need the services of third parties, but it's not a 100% outsourced solution. Dealers have been pushing off understanding how Google works, why Google Places is key for local marketing, why online reviews are important, and how online advertising works. My goal is to challenge dealers, executives, and ecommerce staff to lead their dealership. They will need education to achieve that. Once they have the knowledge, then they can decide who does the work. "As forward-thinking as our dealers are, I will say 95% of them are not interested in managing any portion of their online marketing including PPC, SEO and Social. Even our dealers with Marketing Directors, "eCommerce" managers in place are busy managing the process…not the front-end." I actually find that dealers, given the opportunity, want to learn more about digital marketing. Dealers manage their service departments, parts departments, inspect leases, negate contracts. They are more likely unable to manage these areas because they lack the knowledge. They don't know the questions to ask. Regardless of where they are today, ignorance can no longer be an excuse. Digital marketing is too core to their business to not want to understand and lean how to inspect these critical pieces of there business. After working with one of the largest dealer groups along with several other smaller dealer groups I can say – without education and the drive to learn new marketing and operations, most dealers are WAY behind. They are! Will they catch up? Many will not. Dealers stumble across some smart savvy employees from time to time and either are too clueless to realize their potential or are not sure how to compensate them, so they eventually move on. "60% said they had no budget set aside for education" – I would say this is a very generous percentage. And if they have a budget, they opt-out from using it. Most training is ineffective due to the lack of support and commitment from upper management. After a few several failed attempts, the sales and/or service force no longer take it serious, knowing this too will pass like every other training or change of process. Joe said "The dealer that takes the risk to hire and invest this "digital player" enjoys an enormous lead over their competitors." I've been this "risk" at several dealers and groups over the last several years. I still outsource much of the traditional and online marketing but I'm able to hold these vendors to the fire while pushing their limits in technology and service. I'm also able be sure that our traditional and online marketing are in sync. There are NOT a lot of agencies out there that excel in traditional AND online marketing. And the ones that do – come at an hefty price. There are services you can outsource and there are next level tactics/services that dealers can benefit from by bringing it in-house. I fall into the 39.8% that has considered starting an internship program at your dealership for social media and digital marketing in partnership with a local college or university. Not only have I considered it but have taken the first steps in getting it done. I can train an intern to do things that no agency would be able to do for the price. Plus I enjoy having the opportunity to train someone that's hungry for more knowledge. I work with 50 New Car and Independant Dealers monthly. I was a dealer for 20 years and earned my Automotive Marketing degree from Northwood University in 1985. Lots has changed since than and equiping the next generation for DP , manager and sales pro for 2011 and beyond is a huge issue . Here is what I see. I see second and third generation DP's who have little or know understanding of how consumer behavior has changed in the last 5 years. They have hired managers to get results who are just as uneducated as them in these changes and I see a gray haired population of old school sales folks still hanging out at the front door waiting for the "UP's" to return. Where is the next generation going to come from ? Consumer behavior has changed so fast and will continue to do so that most dealer's and their managment team know the business has changed, they just don't quite know what to do about it or the steps to take to fix it. ……I was at a recient meeting with about 60 dealers who were there to learn how to change there business model. 80% were 55 years and older. The most common question was ; "OK , I know I need to change , but who is going to do it for me "? "I'm not tech savy". Frankly these guys have missed the boat that left 9 years ago. With the rapid, almost quarterly changes happening I see almost no help of even getting the DP's , Managers and 55 and older sales dude to learn the new skills to adapt to todays car biz.. Interns ? Maybe. A new Dealer School focused on todays car biz.. On-line education and training ? What would be the most effective ? What is the most urgent priority ? Want new blood on the sales floor? Change the pay plan, change the hours worked. Change starts at the top. No bandaid solutions to the existing model. Brian, if I'm understanding your response correctly, there is no dispute. Dealers SHOULD educate themselves and understand enough about all aspects of marketing (online and offiline) so that they can have a constructive dialogue with their agency. There is no argument there…nor should there be. The more the dealer knows, the better the working relationship with the Vendor. What I will argue is the granularity of involvement from the Dealer. I personally don't think any dealer (the Joe Pistells of the world aside) should be hiring staff to actively MANAGE their online marketing – meaning the actual media buying, reporting and maintenance of those programs. And by hiring an intern, you are assuming there's someone at the dealership to monitor their performance. If I was hired at a dealership tomorrow, with all my online marketing experience I would still hire a 3rd party agency / vendor / consultant to buy and manage my media. At the end of the day, I just need the bottom line ROI report and the ability to decipher it. It's really easy to point out the obvious need in our industry relative to what we now call digital marketing. EVERY ONE that reads the articles and comments here at DealerRefresh should be in agreement that education and commitment to continued training should be a top priority for dealers. Internet training, education and preparedness should have been a top priority for dealers for the last 10 years. It's a true reality, but it's far from a new reality. So, why are most dealers still in neutral? Shaun – Dealers are still in neutral because most of the "training" offered by companies today are just commercials for their own products. In fact. most of the vendor training I've witnessed consists of vendors peeing on dealers and telling them that it's raining.